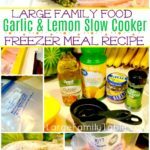 You’ll end up with four Garlic & Lemon Chicken Slow Cooker Freezer Meals with about 2.5 lbs of chicken each. This delightful dish is super healthy and low carb friendly. We enjoy it with steamed vegetables. Make it work for you! TOTAL Slow Cooker Ingredients for 4 Dinners! Removed excess air and seal your freezer bag. Write the Recipe name/date on the front of the bag. Place in your freezer until needed. You can combined all ingredients in something like this large mixing bowl, then divide evenly across 4 gallon freezer bags. The night before you need your slow cooker freezer meal just set one gallon freezer bag in the refrigerator to defrost. The following morning just dump the entire bag contents into your slow cooker. Cook on high for 4-hours or one low for up to 8-hours. Slow cooker times may vary.